A couple of years ago, 4K LED TVs used to be very expensive. Decent 4K LED TVs were priced above 50000 to 60000 Rs. But now they have become very affordable. You can get a nice 4K LED TV from around Rs. 25000 with 43-inch display size. In this article, we have covered the best 4K TV under 30000 to 40000 in India 2019. If you don't know what 4K is then here is a simple explanation: 4K resolution, also called 4K, refers to a horizontal display resolution in the order of 4,000 pixels. In television, 3840×2160 (4K UHD) is the dominant 4K standard. Full HD TVs have 1920x1080p so in the 4K display, you are getting 4X pixels as compared to an FHD display. Latest 4K LED TVs from brands like VU, Samsung, MarQ, Cloudwalker, TCL, Onida, Mitashi are available in the 30-40k range and have been covered here. The display size of these LED TVs is 43 inches in most cases. Some 50 and 55 inch TVs are also listed. So if you have a large room or a hall, you should go for a larger display size tv. In addition to getting crystal clear pictures with plenty of details on a 4K Ultra HD LED TV, you would also get Smart TV functionality on most the televisions using which you can stream videos and play games as well. The LED TVs on this list are very affordable and cost between 25000 and 40000. If you can spend more and need a 4K LED TV from a brand like LG, Samsung or Sony, then take a look at our list of best 4K LED TVs. Let's take a look at the best 4K televisions under 30k to 40k in India. A short review is provided for each TV with its pros cons. Links to Flipkart and Amazon are also provided. 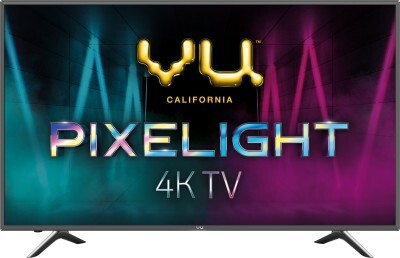 This LED TV from VU's Pixelight series of 4K LED TVs launched by VU in 2019. It comes with a large 50-inch display and an Ultra HD 4K resolution. As expected from VU, the build quality of the LED TV is great and display on the front is gorgeous. The colors are sharp and vivid and viewing angles are great. Next, the most important thing in TV is sound and this LED has loud and clear speakers. You won't feel the need to attach external speakers to this TV as the dual speakers deliver a sound output of 24W. The TV has built-in Dolby Digital Plus technology as well. While the DTS TruSurround technology will wrap you in sound. If you like deep bass then there is DTS TruBass technology which will provide a provide a great immersive experience. It is a Smart TV running Android and is very easy to connect to your home or office WIFI and to your phone as well. You can mirror your phone screen to this TV in just a couple of clicks. Smart TV functionality is easy to use and works well. The TV comes with a remote which has dedicated buttons to launch commonly used apps like Prime Vide, YouTube, and Netflix. There are some games installed as well which is something kids would love. Overall, it is a solid 50 inch 4K Smart LED TV from VU and is one of the best you can get for a price of around Rs. 30000. This is a large 55 inch LED TV from Kodak with Ultra HD 4K resolution and Smart TV capabilities. It is priced attractively at under Rs. 40000 in India. Similar options from big brands like LG, Samsung cost 20000-30000 more than this. This LED is well build and has a bright and sharp display. The display has auto depth enhancer which provides an immersive visual experience by applying various levels of contrast to different areas on the screen which in turn gives you an outstanding image depth. To connect external devices like a set-top box, pen drive, laptop etc, there are 3 HDMI ports and 2 USB ports on this LED TV. The sound from speakers is decent as well. As it is a Smart TV, you can connect it to WIFI to play games and watch movies. 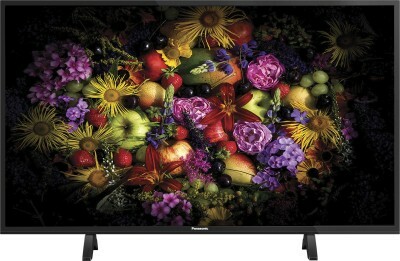 Overall a value for money LED TV from Kodak. So that was our list of best 4K LED TVs under 30000 to 40000 Rs. in India. We hope the list was helpful and you were able to find a new 4K LED TV for your home or office. If you can spend a bit more, take a look at our list of best-led TVs under 50000 in India. Let's take a look at our favorites of this list. iFFALCON 55-inch Ultra HD 4K Smart Android TV is our favorite tv under Rs. 40000. It comes from brand TCL and the performance of this tv is excellent. Plus, you get a massive 55-inch display.